On Friday, Thai police wrere trying to keep anti-government protesters from entering the grounds of the prime minister's office building, as anti-government groups began escalating their efforts to push Prime Minister Samak Sundaravej out of power. 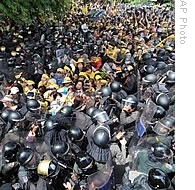 More than 8,000 police were keeping a close eye on thousands of protesters who gathered around the main government building in Bangkok on Friday. Samak's coalition government is closely linked to former Prime Minister Thaksin Shinawatra. Thepchai Yong, managing director of the Thai Public Broadcasting Service, said the country was deeply divided between those who support Thaksin and those who oppose him.